Okay, here's how we play the game. Custard, the band, put out a new album. And I go through it, one lyric at a time, writing down everything I know. I've been a Custard fan for a long time, and I'm from Custard's hometown of Brisbane, so sometimes the connections I make are well-informed. But it's pretty hit and miss. Really I'm just sharing the thoughts that bounce around my weird little brain as I listen to a new record over and over. Repetition makes for some pretty crazy thoughts. The Common Touch came out in the second half of 2017. It's their second album of their long-awaited comeback. "Everybody's talking at me, I don't hear a word they're saying." Is it too early in the album to mention Shakespeare? Not if you're Custard. I wonder how much of the Bard's work we'll see throughout this album? And do you think, as Shakespeare lay dying in 1616, he would've thought to himself, "I wonder if, 401 years from now, my paltry works will finally be referenced in the works of Custard?" Oh what are we gonna do? This is what the philosophers call the "Existential Angst." ...which I've interpreted as being about the record deal that ABC presented them with. Now, they're still suspicious of this gift, and still not sure how things will turn out. They don't want to wear out their welcome. ...and they're afraid that the comeback might fizzle out and be soon forgotten. I know the feeling. You know the feeling when you decide to write 10,000 words about an album and you end doing more research than you can fit inside a single human lifetime, so you're forced to build a device in which you can save up time and you fall asleep in there and emerge 1000 years later? That's how it feels. By "mouth wah-wah" I mean the effect of using the facial apparatus to impersonate the sonic distortions that arise from using a wah-wah pedal (with an electric guitar) to create a spectral slide by rapidly sweeping a frequency filter up and down. The wah-wah pedal itself impersonates the use of a bell mute on a trumpet, which in turn impersonates the sound of a person moving their lips in and out as they cry uncontrollably. So it's a deep moment. Also reminiscent of Fozzie Bear saying his "Wokka Wokka Wokka" catchphrase. ...) No, this is a far more punching stab at the meaning of life itself. This is nihilism. More than that -- it's not even simple nihilism, it's Existential Nihilism. The space theme is completely on point. And the line "Don't give me no alibis" fits with the grand tradition of grammatical laxity in song lyrics. Shown about is a scene from Zabriskie Point with books exploding. 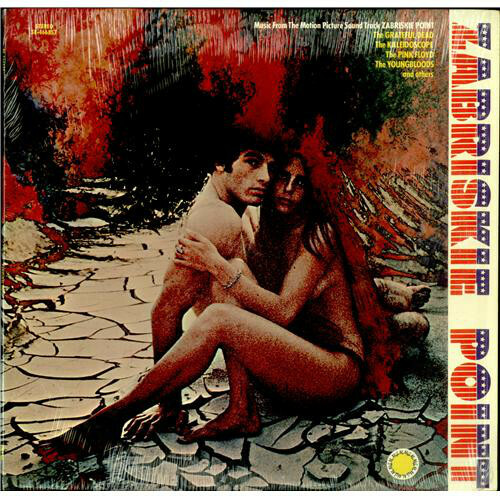 The Zabriskie Point soundtrack featured Pink Floyd, Grateful Dead, and others. I picked up a copy of this for about 50 big ones last year and was pretty pleased with the outlay. I don't know much about the film beyond that. Did the books explode in a world that was out of time? Perhaps they weren't referencing the Custard song after all? Or is this lyric a reference to the Nazi Book Burnings of World War II? Nasty business. Reminiscent of the first lyric of the album Wahooti Fandango: "I will take your hand, we'll travel across the land"
But also reminiscent of the kind of songs that launched the Beatles onto the world scene. There's certainly a lot of British 60's music coming across. And then we roar into a "BIG FINISH". One of the biggest finishes to a custard song. Some have called it 'sumptuous'. There's a lot of trumpet and then a lot of harmonica and then a lot of both. The trumpet is a piccolo trumpet played by Desmond Honeybottom. And the harmonica is played by Little Roy Grunt. Little Roy Grunt is a great monicker. I wonder who he really is. That's Jack Ward on cello. 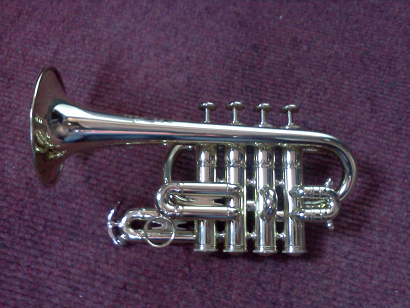 Here's a piccolo trumpet. It's an octave higher than a regular Bb trumpet. It took a while to work out what Beatle's song this reminded me of. But when I found it I knew for sure. There's a piccolo trumpet used in Penny Lane. Listen for the little solo from 1:13 to 1:30. Hey! I remember that! 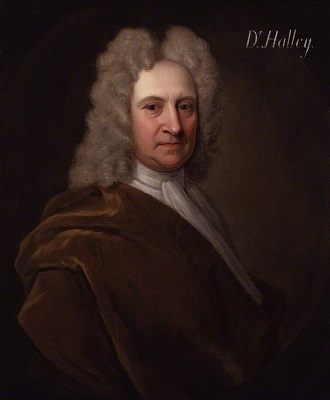 I watched Halley's Comet go by. For my part, the comet itself was a bit of a dud. I'd heard that my grandad saw it last time, and it was so bright in the sky you didn't need a light on your push bike to get home at night. (That sort of rhymes...). Regardless, time spent outside staring at the night sky during my formative years helped me develop a lasting appreciation for atronomy and gave me a sense of the awesome wonder at the vast endlessness of space. Reminiscent of "the taste of scotch rich on my tongue" from "This Year" (aka "I'm gonna make it through this year if it kills me", by "The Mountain Goats"
And looking for a word to rhyme with "gin", we have.... "anything"? But don't play "Forever Now"
I thought this was a reference to Cold Chisel's "Forever Now" - and indeed when I got my hands on the lyrics and found doube-quotes around "Forver Now" I was not disappointed. Now we've departed into Science Fiction territory again -- awesome! What's happened during this part of the song, is that things have taken an unexpected twist. Our intrepid party revellers are outside looking for Halley's Comet, when a meteor shower strikes the earth. Only a tiny handful of people survive. This is similar to The Blindness in "The Day of the Triffids" and an episode of the show Benson that it was based on. After talk about Halley's comet, Kraus dreams that she and Benson are the only ones left on earth. How good was that episode? The triffid is also a music venue in Brisbane, as which Benson has never been spotted. And how'd we get to here and how are we going home? 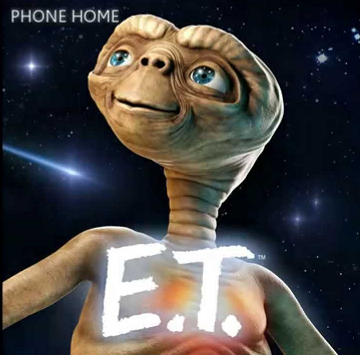 ET -- the Extra Terrestrial -- was also plagued by this question, "How am I going home?" You know when you're walking through your home town, when you haven't been there for a long time, or when there's been an apocalyptic meteor shower, and you see a newsagent that is now abandoned? That's the landmark we're evoking here. Notice we're in a cab. So we've returned to our home town but we haven't rented or borrowed a car. We're getting about in cabs. Maybe the same cab from Rice & Beans. What was that place you lived before? On this nostalgic tour of the old home town we head down empty streets trying to find the place where the girl we used to love used to live when we loved her, but the streets don't yield their secrets. How'd you get all those bruises? What? Now we're bringing in the domestic violence motif, as mentioned in The Streets of Your Town, which also mentions streets. Ann Hodges was hit by a meteorite in her Alabama home in 1954. It's unlikely that this song is about Ann Hodges. But unlikely doesn't mean impossible does it, Sherlock Homes. How'd we get to here and how are we going home? You mean you still don't know. Given that you were in a cab just a few lines ago, it's possible you could use that cab to get home? Now there is a bridge. And it's not just a bridge. It's Bridgey Bridgerson, the bridgiest bridge in bridge land. It's the bridgiest bridge since "There's a stretch of road, out past the gap" from "Nice Bird", and that was Quite Some Bridge. Centuries is a long time for a person to be intrigued. People don't generally live for centuries. Humans, as a species, have been intrigued about certain topics for centuries and longer. The Pyramids spring to mind. What is with those pyramids? And Roman dodecahedrons. Those things have led to centuries of intrigue. But for my money, nothing surpasses The Antikythera Mechanism. Choosing to let the comets go by instead of engaging with them, is much like some of the central meditative practices of Acceptance and Commitment Therapy. Do you let yourself get Hooked In by a passing thought -- thoughts bubble up and arise and fall and swirl around inside the mind -- or do you allow them to drift, drift by. The purpose of a bridge is to lead you into the chorus and the line above explicitly achieve this goal. Oh please don't play "Forever Now"
Brabra Streisand, "Piece of Sky"
It's possible that this "piece of sky" is what is seen out of the window of a hospital bed. I have a theory here... that this song is about a dying man talking to his son, in a hospital room or a nursing home. The visitor is poring over something, perhaps some paintingS on the wall, or records in a collection, or books on a bookshelf. Book or records or paintings collected over a lifetime. ...please, please take more, take them because I want you to take them. How much longer will I survive? Weather is evocative, and always worth including in a song. Weather is a more expressive way to reveal your feelings than any direct statement about your feelings. A suitable level of indirection is necessary in ever work of art to achieve the necessary. Ok, now this is how you play the "I'm thinking of a number" game. You say something like "I'm thinking of a number between 1 and 100" and the person guesses the number. You then say "higher" or "lower" or "Correct." I once built a "guess a guid" game that is a heap of fun. Like, so much fun. It usually takes about 100 guesses to narrow down on the correct answer. The upper and lower bound of the range should both be numbers. So the line 'Somewhere between me and you' doesn't make any sense unless me and you are numbers. Who is to say that you and me are not numbers? Would a number know that it was a number? Why do you think that? Are you, speaking as a number, a reliable source of number facts? Oil and water do not mix, and when oil sits on top of water, and the water moves around, the sides of the oil are momentarily not parallel. This causes refraction to occur, as seen on the cover of Pink Floyd "Dark Side of the Moon", and thus the appearance of trippy swirly rainbow patterns. Watching oil on water is a fun way to pass the time. Watching water boil is just as fun. I'm happy watching the water boil, I love the way the water dances. The automated sprinklers at the grounds of a hospital or nursing home. A melancholic mechanical chattering. At first when you're unwell, when you're dying, no one else can see. The symptoms are invisible. You tell people, but they do not believe. "See? 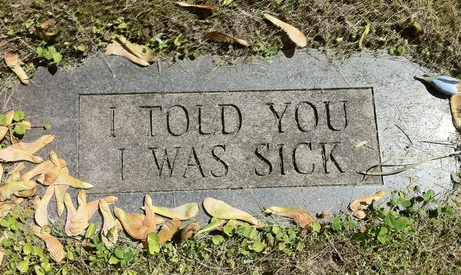 I told you I was sick!" ...a fitting and inevitable end for a life long hypochondriac. Over use of the word "baby" is a rock n roll epidemic. Even the rock and roll programming language embraces this norm. The illness progresses to a point where it's no longer experienced only inside the mind of the affected. Blind Freddy on a Galloping Horse becomes aware of it. Now we're talking from a different point of view, from the pov of the son not the father. In response to the father's request, we got rid of all those collected items. We sold them. There was one thing I couldn't dispose of. The thing you forced me to take. The thing I didn't even choose to take. It holds the most sentimental value of all. Hints of the apocalyptic theme of the album. One's own death is a personal apocalypse. Here there's a shift and we take the track in a different direction. It's a Christmas jingle! Go firgure. There's a disconnect here. The lyrics say "Princess", the title says "Princes". The Princes Highway is a major road in Australia, extending from Sydney to Port Augusta via the coast through the states of New South Wales, Victoria and South Australia. A highway with no-one on it. I was introduced to this lyric by the "U2" song "All I want (is you)" which I maintain to this day, is an OK U2 song. Perhaps the only OK U2 song. Would you like to watch T.V.? Or get between the sheets? Or contemplate the silent freeway? Would you like something to eat? 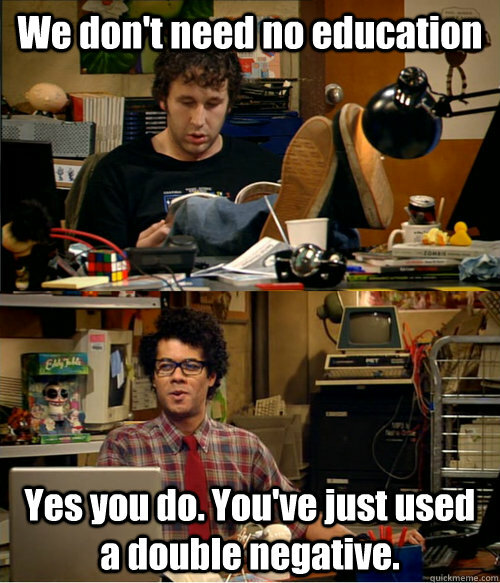 Would you like to learn to fly? Would'ya? Would you like to see me try? Hard Rain's A Gonna Fall, is an early highwater mark in Zimmerman's lyrical craftwork. He takes a structure from the traditional folk songs he'd cut his teeth mastering, and overlays the hypnotic myriad of ideas that would become his signature. Sort of thing. And who could forget Edie Brickell's cover of "A Hard Rain's Gonna Fall" from Born on the 4th July? Edie Brickell has been touring with Steve Martin, by the way, as he dazzles the world with his glittering banjolele. Have you thought of going home? Yes, that's three times now. They had a song called "alone" once. That was the track that made me take notice of this band. So glad I did. Hearts - and the damage they endure - are a recurring motif of the love and break up song playbook. It's likely that the heart is not literally melting in a fire. Were that the case, it would be a medical marvel for the afflicted individual to find the energy to write a song about it. It is however a definite reference to -- spoiler alert-- the heart of Howl, from Howl's Moving Castle, which powers the moving castle and is voiced by Billy Crystal. And also, I never promised you a rose garden. Okay? If you're not familiar with it, the song "I never promised you a rose garden" by Lynn Anderson, is the diss track of its era. Ah, we're back in the childhood streets. I lived in London for a couple of years. And when I returned to Brisvegas one of the things that blew my mind was just how wiiiiiiiiiiiiiiiiiiiiiiiiide the streets are here. On the last album a phone rang exactly 47 times. It not likely that a phone would be left to ring for a thousand years. They tend to "ring out" much sooner. But even if they didn't ring out, it would be very hard for a phone company to go 1000 years without disconnecting an attempted call. Even continuing to pay your bill across many generations would be a remarkable feat. I have a theory hear but I'm not going to say what it is. You know when you catch up with a long lost love and they've had kids or gotten married or divorced or changed their name and you congratulate them? That's what this is. 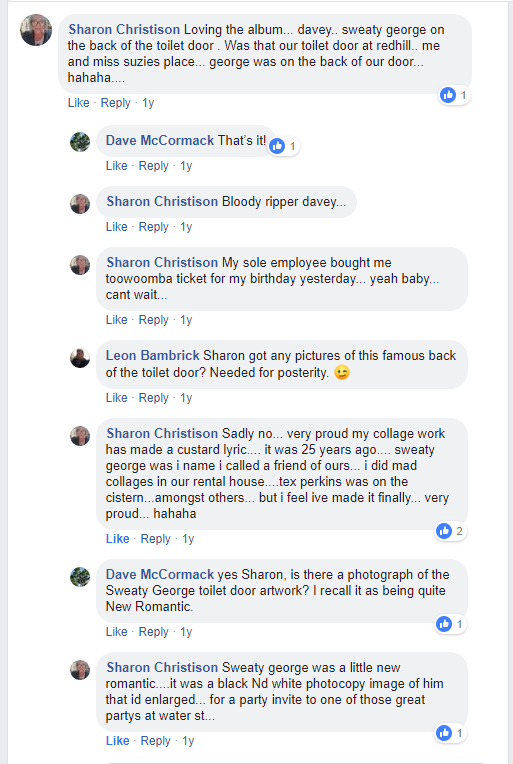 Dave McCormack: yes Sharon, is there a photograph of the Sweaty George toilet door artwork? I recall it as being quite New Romantic. Because I overthink things, I deconstructed the above and thought about this " miss suzies place" and wondered to myself.... Does "Ms Suzie" mean "Suzie Hansen" -- see, Dave McCormack was partnered with Maureen Hansen for a while, excellent person is Maureen, and you can hear her vocals in the band "Miami". 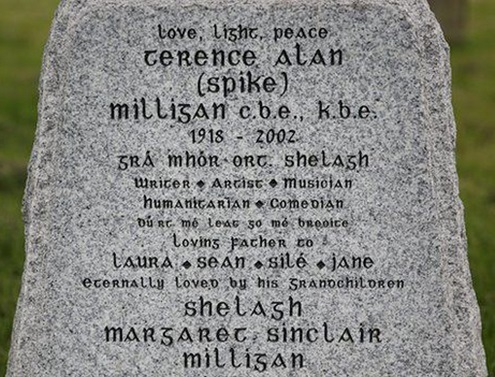 Maureen has a twin sister called Suzie (according to the history of custard zine from DFHannah). So is that who lived at the place with Sweaty George on the door? Suzie Hansen? But then I realised: Suzie could be anyone! At that point in time, in Red Hill, fully 50% of the people had the name either Suzie or Cathy. And amongst women the percentage were even higher. "And these four walls.... they're loose in my mind"
So why don't we go? What are you complaining for? And what are we waiting for?